Once the weather heats up, I look for simple, fresh side dishes to complement our standard summer fare. I spotted this recipe for Sauteed Radishes and Green Beans on the Taste of Home site, and patiently waited for green beans to appear at my local farm so I could make it. Prep goes quickly on this one, and the only thing I changed was to use pepitas instead of pine nuts. For the first stage of cooking the green beans, mine were on the larger side, so it took almost 6 minutes for them to get crisp/tender. Make sure to keep them moving or they will brown. I loved the slight heat of the radishes and the sweet and salty flavor of the dish overall. The pepitas gave a nice crunch. This was a great side to some cheeseburgers, and with some chicken the next day. I'll definitely be making this one a lot this summer, thank you to Pam K. for sharing her recipe! We are huge muffin fans in this house, but my guys tend to like the same variety over and over again. I marked this recipe for Brown Sugar Oat Muffins to try back when my husband went through a brief phase of wanting to eat oatmeal from scratch, and had bought 2 giant canisters of oats. They've been complaining about the lack of baked goods in the house, so I pulled out the recipe this weekend. Just a few minor changes to this one. I used whole milk instead of 2%, it's what we had on hand this week. I used caramel extract instead of vanilla. I scooped the first 6 muffins, and then I added blueberries from our bushes to the second half of the batter. I got 10 muffins, but I fill the cup the whole way instead of 2/3rds. I've been making this recipe since July 2011, it's a family favorite. Next to chicken, the thing we eat most around here is ground beef. Jake's an odd duck- he'll eat tacos til the cows come home, but he is 50/50 on eating burgers. I thought this would be a great meal to please everyone and it really is. I mix everything inside a ziptop bag, kneading from the outside to keep my hands clean. I've got two sets of burger presses, square and round. They make nice uniform patties. Sometimes I use cheddar, sometimes I use pepper jack. On mine, I use a dollop of salsa and sour cream. Such a nice change from plain burgers! Thank you so much to Linda L. for sharing the recipe! I find that people either love or hate eggplant. I didn't even try it until I was in my 30s. Mostly I eat it breaded and baked, but this Spicy Grilled Eggplant from Taste of Home caught my eye a while back so I gave it a try. Super simple, only a few ingredients. I had Cajun seasoning on hand, but if you don't, you can definitely make a homemade version. If you don't have a grill, this can definitely be done inside on a grill pan or panini press. Don't like eggplant? It would be awesome with zucchini or summer squash too. Thanks so much to Greg F. for this delicious recipe! On Tuesdays, I like to share what my fellow Taste of Home Volunteer Field Editors are making. This week, Angela's serving up Easy Grilled Corn with Chipotle Lime Butter. Guess I'm headed back to the farm for some corn! Hot dogs are a summer staple around here, and the more ways I can find to serve them up, the better! We love sloppy joes, so when I saw this recipe from Taste of Home, I couldn't wait to give it a try. The only change I made was to use red bell pepper instead of green. I actually made the topping ahead and split it into a few batches. Some I stashed in the freezer, and the rest I kept in the fridge. This made the meal come together super quickly. I just reheated the sloppy joe mixture in a disposable pan on the grill while I cooked the hot dogs. 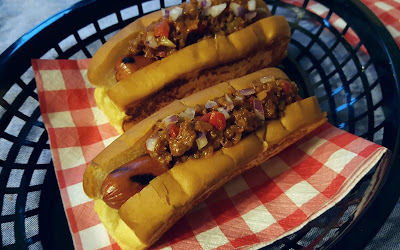 In this house, hot dogs are always served on New England style buns. I've even shipped them to friends across the country that can't get them because I feel bad they're missing out. I'm so excited to see that Karen is sharing a recipe for homemade ones this week! I spread softened butter on each side of the roll and grill them until they are golden brown. Oatmeal is one of my go-to breakfasts, so filling and good for you. I had been eating lots of traditionally made hot oatmeal, but when the warmer weather hit I stopped. 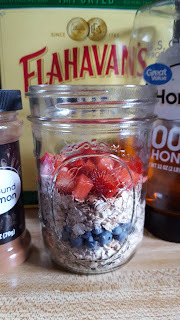 I've seen so many recipes for overnight oats on Pinterest and Instagram, and finally I dug out my ball jars and made some myself. Initially I made this recipe from Taste of Home exactly as written. Since then, I've made a couple of the variations given, and slightly adapted ones as well. I use almond milk instead of regular milk, and greek yogurt. I am not a fan of walnuts, so sometimes I use pecans, sometimes I use granola. It's great with either honey or maple syrup. I also add a teaspoon of chia seeds, and a dash of cinnamon. I like to layer the ingredients because it looks pretty :) I always use Flahavan's Irish Oats, they're my favorite. This version I made, I used blueberries from my yard, strawberries, honey, cinnamon, chia. One of the things I love most about blogging is how it inspires creativity, and forces me out of my cooking comfort zone. When Camilla from Culinary Adventures with Camilla suggested that the #FestiveFoodies make dishes for Bastille Day, I hesitated. French food is not something I really cook or eat often. But then I remembered how my guys bought me a kitchen torch for Christmas, still sitting unopened in the package, and I thought, "What a great excuse to make creme brulee!" I searched through lots of recipes, and these Caramelized Baked Custards seemed like the perfect starter recipe. We've always got Bailey's on hand, and all of the other ingredients are pantry staples too. These come together easily, and my tip to you would be to beat the eggs and sugar in a 4 cup glass measuring cup (like Pyrex). That makes it much easier to pour the custard into the ramekins rather than out of a bowl. It's Taste of Home Tuesday! It's been crazy hot here in New Hampshire, and one of our favorite ways too cool off has been with ice cream floats. I made amazing homemade fresh strawberry ice cream, and I searched for a recipe to use it in and found these Strawberry Patch Frost on the Taste of Home site. Floats are so easy to put together. This one starts with a little strawberry jam in the bottom of the glass, mixed with a little water. I made it with plain this time, but I've got some strawberry jalapeno that I think would be awesome too. Add your sliced strawberries, ice cream and heavy cream. Next, pour chilled sparkling water over the top. If you're not a fan of sparkling water, you could definitely use a lemon-lime soda instead. There are also some "hard" sparkling waters hitting the market that I think would be awesome. July is National Ice Cream month, and the Festive Foodies are having an Ice Cream Social! Grab a spoon and dig in to all the awesome recipes we're sharing today! We're huge fans of Ben & Jerry's ice cream. We've road tripped up to the factory and done the tour, which is so fun! I've had the Ben & Jerry's Ice cream & Dessert Book for many, many years, and have made quite a few of the recipes from it. Since strawberry season is still going on in New Hampshire, I chose that recipe this time around. I have a stand alone ice cream maker that requires rock salt, but I also have an attachment for my KitchenAid stand mixer. I keep the bowl part in my upright freezer all the time, that way I don't have to wait for it to get cold if the urge to make ice cream strikes. Cookies are always a big hit here. I've been tweaking this recipe since 2005 when I entered it into a local cookie contest. It's loaded with delicious dried fruit and white chocolate chips. I go with dried cherries and blueberries when I want to make the patriotic version. Do buy good quality white chocolate, there really is a difference in taste with the store brand. If you can't find the superfine sugar, you can make it at home by pulsing granulated sugar in a food processor to break the crystals down. This is NOT the same as powdered sugar. To get uniform cookies, I like to use a cookie scoop. This helps them all bake evenly. These are great on their own, but they make wicked good ice cream sandwiches too! If you aren't a fan of white chocolate, you definitely can use semi-sweet, milk or dark. I've also used cherry flavored dried cranberries in place of the cherries.